Rectus femoris is a muscle that runs in the front part of the thigh. 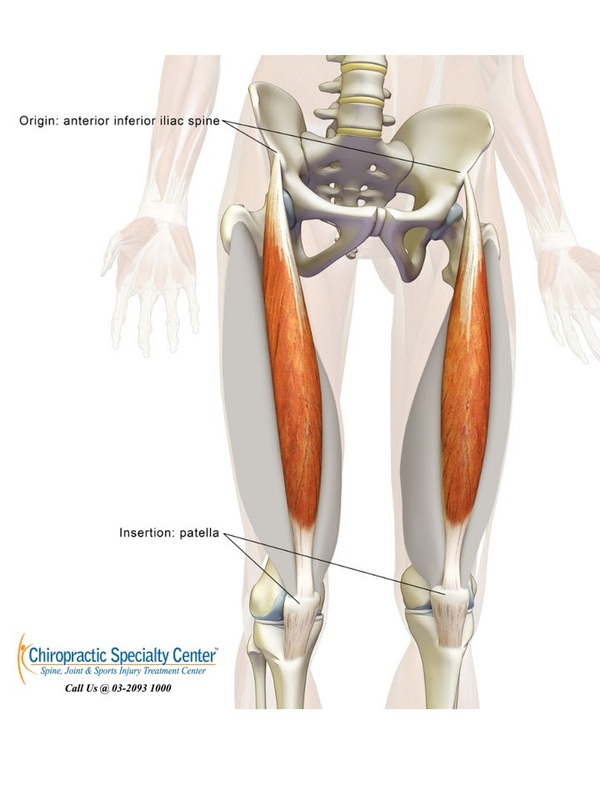 It originates from the anterior inferior iliac spine of the pelvis bone and the acetabular rim of the hip joint. It inserts into the upper part of the knee cap and indirectly into the tibial tubercle via patellar tendon. Rectus femoris acts to bend the hip joint (hip flexor) and straighten the knee (knee extensor). Knee pain, hip pain, and even back pain results when the rectus femoris muscles are injured, tightened or weak. The clinical teams of Chiropractic-in-Malaysia wanted to shed light on rectus femoris muscles instability or damage, as many of the injured patients visiting us have had issues. Unfortunately, for most the previous treatments or therapies they received from others were not helpful. Others could not help them as they lacked the needed skills, technology or clinical teams to fix all related issues holistically. We hope the article in this blog will help you identify centers in Malaysia that can provide you with the needed treatments. However, if you have difficulty finding one, just call Chiropractic Chiropractic Specialty Centers have the skilled non-surgical teams you require for rapid improvement. Why Understanding Mechanisms of an injury is Critical in Your Recovery? Increased tightness in the rectus femoris can cause restriction of the hip extensors. This results in a decrease in the stride length during walking. And as such, there will be an increase in the curvature of the lower back due to this muscle tightness. Additional stress can be imposed on the pelvic as a result of increased pelvic rotation in the horizontal plane. The ankle and foot will compensate for the decreased hip extension by increasing plantar flexion of the ankle and foot to lengthen that leg. A lengthened rectus femoris muscle is at high risk of strain or sprain with sudden excessive hip extension. 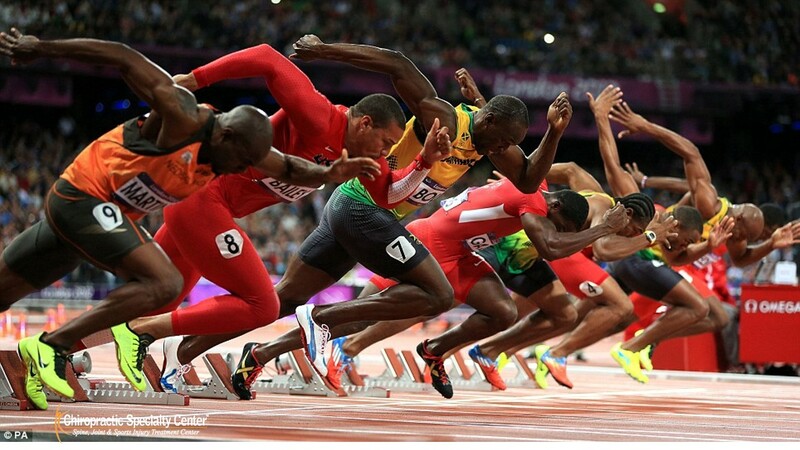 Simultaneous contraction of the quadriceps muscles will further increase the risk of injury. For example, when an athlete pushing off the blocks from a sprint start, he or she has to extend the hip of the front leg (driving leg), while the quadriceps has to be activated to help stabilize and straighten the knee. The rectus femoris needs to contract under maximal tension in extreme hip extension to initiate hip flexion. This will pose the muscle under high risk of injury. It is this very mechanism of injury that is misunderstood by most therapists and chiropractors in Malaysia. The better your caretaker understands the mechanisms of your injury, the higher chances for a speedy recovery and avoidance of similar injuries in future. Many centers, unfortunately, do not pay attention to these smaller details. And as such, most of their injured athletes return with similar injuries time and again. Well, that will not happen when you visit one of the clinical experts associated with Chiropractic-in-Malaysia. Call our main center at 03 2093 1000 for the best and most complete knee pain, hip pain and rectus femoris treatments in Malaysia today.